Magnolia blossoms are such a beautiful sign of spring that I thought I would post this photo of a tree in bloom just down the road from my home. I wish it was in my garden. 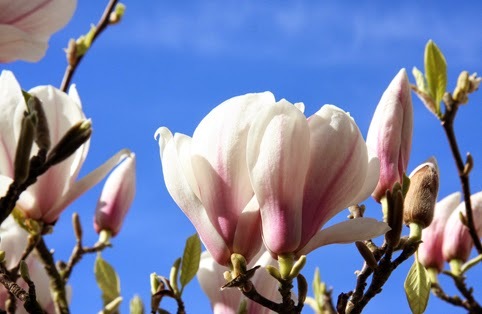 I love the huge, pinky-white flowers and it seems a shame that these days the name magnolia is often associated with the bland paint of choice for redecorating a house before trying to sell it. Magnolia - the tree, not the paint - is a very ancient plant genus and was around before bees. The large flowers with sturdy petals are thought to have evolved to encourage pollination by beetles. Nowadays there are many different types of magnolia that thrive in various conditions. According to an old book I often refer to for flower meanings, called The Language of Flowers, laurel-leaved magnolia means dignity while swamp magnolia means perseverance. I have also heard that it can be a symbol for beauty. According to Cunningham's Encyclopaedia of Magical Herbs, magnolia is associated with the planet Venus and the element of Earth. Its powers are linked to fidelity and, according to folk magic, placing some magnolia blossoms next to the bed or underneath it can help maintain a faithful relationship.